The story in this game isn't very complicated and is very straightforward but that's not a bad thing at all as I liked it for that. Another thing I liked about the story is that is very interesting and you will keep on playing to see what will happen to Abe on his Odyssey. The story is also full of charm due to the characters, they have a lot of charm and character despite a lot of them playing very minor roles. Does the story still hold up in this modern day and age though? Despite the simple nature of the story, I will say that it has aged very well and is just as enjoyable today as it was back then. 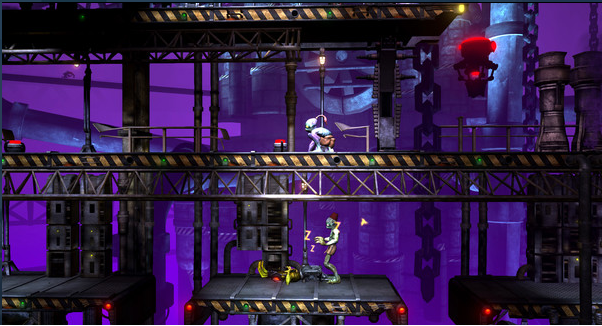 Gameplay is that of a 2D adventure platformer that gives you certain goals to beat for if you want the best ending. 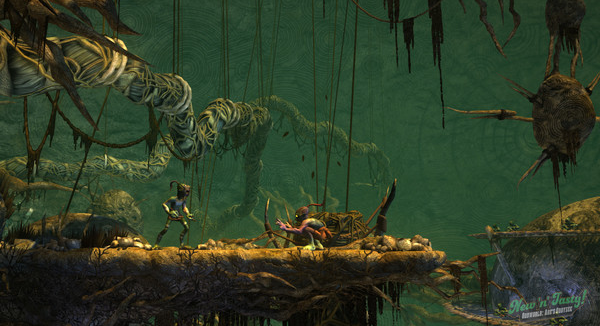 The main goal is to just simply survive every stage by making it to the end, the secondary goal is to rescue all of your fellow Mudokon and lead them to safety. Neither goal is easy and you will have to deal your way though fierce platforms, fierce enemies, and fierce puzzle solving. Puzzle solving is very strong in this game, every area is a puzzle within itself and so you will need to think awfully hard at some points of the game but it is a very fun and satisfying thing to do. This game does have an auto-save option for when you beat a chapter or reach a checkpoint and so it can get annoying to be able to save the game, especially if you are doing a tough puzzle that has checkpoints that are very far apart from each other. Lucky for you, this game also has a manual save option that works like a save state and this comes in handy, especially for those said tough puzzles I mentioned before. This game does have a chapter section menu and you can visit any chapter you have beaten in the past and this feature does come in handy. The reason why the chapter select section came in handy was due to me stuffing up so bad on one stage that it became impossible to progress any further, so I just used the chapter select to restart that chapter. The downside was that I had to start that chapter off all over again, it wasn't a short chapter either and to do all that again was rough, so I wouldn't be surprised if I saw people quit playing the game if they ever got into that situation. 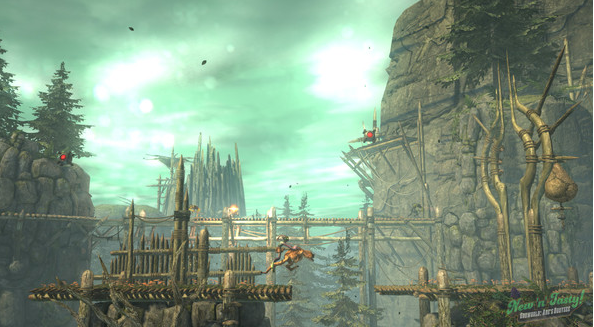 Abe's moves are very simple as he walks, rolls, can hang on to ledges, can throw rocks, so this means that you are a very underpowered character in a really dangerous world and thus adds to the puzzle element of the adventure. One strong power that Abe does have is the ability to possess certain enemies and take over them completely and this is as much fun as it sounds. Trying to possess an enemy isn't always easy as you will need to find the right position to do so or you'll find yourself spotted by that enemy and killed on the spot. There's also weird machines that are designed to give you a jolt of electricity if it detects you trying to possess someone. Abe also has a simple to use command system that can be used for multiple things... Hang on, let me rephrase that.. Abe also has a simple to use command system that has to be used for if you want to fully beat the game. You'll be needing to use it for when you are trying to lead the other Mudokon, used to get pass password protected passages, and can even be used for when possessing enemies for when you'll need to get through restricted areas or for wiping out other enemies. Do not worry about the command system being confusing to use, it is far from it as you'll just need to hold down the CTRL key and hit any of the action buttons (the buttons used to jump, run, etc). There's a very simple mode in the main menu that tells you all of the commands, you can also practice them in that same mode and it is very good that this feature was carried over from the original as it comes in handy. One thing that is new to this version is that they removed one of the commands and replaced it with a new one. 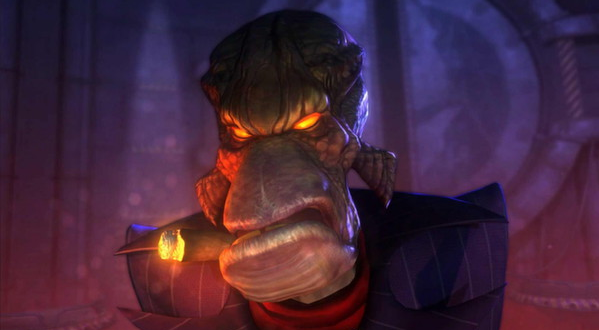 The old one to which I speak is the command to make Abe snarl and it was replaced with a command that has Abe yelling out "All of ya" for when you want multiple Mudokon following you. This new command sure does sound very useful and it very much is although they could've easily been able to make Abe command a lot of Mudokon, just using the "Follow me" command. 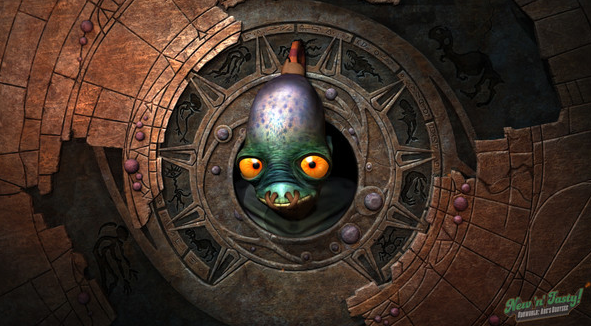 This version of the game also has spanking new voice track and I was mixed on it as the new voice for Abe is very goofy and doesn't suit him at all. The new voice for Abe also makes it hard for me to take him seriously and that's a shame. The new voices for the other characters was something that I had no problem with and found them charming and funny. I was also very fortunate to play some of the DLC to this game and all I have to say is that they aren't essential to the enjoyment of this game. One of the DLC is a whole bonus episode about a side character named Alf (no relation to the lovable alien of the same name). Alf's goal is to also escape Rapture Farm but good luck trying, his episode is really hard and drove me into a fit of pure rage. The other DLC is a costume change for Abe that puts him in his janitor outfit and it is a DLC that doesn't add anything at all and ranks up there with the horse armor from Elder Scrolls IV: Oblivion (2006), it's that damn useless. Overall, the Alf DLC is good for if you want a really tough challenge while the costume DLC is not worth getting at all. Controls in this game feel like it plays right from 1997 as while responsive, it can also be very rough to handle, especially for if you are trying to rush through the game. This is a game I recommend playing with a controller as playing this with a keyboard made the experience more complicated than what it needed to be due to the keyboard controls being very spread out. This game isn't very long as you can beat it in a day although this game has strong replay value due to wanting to save all of the other Mudokon, so you'll want to beat this game a few times. This is also a game where you can train yourself to speed run with each time you re-play as your skills will sharpen the more you play. Graphics in this game has gotten a huge face lift as instead of having claymation styled 2D graphics, it now done in 3D graphics made from the (*holds in vomit*) Unity Engine (*swallows vomit*) and is thus now a 2.5D game. 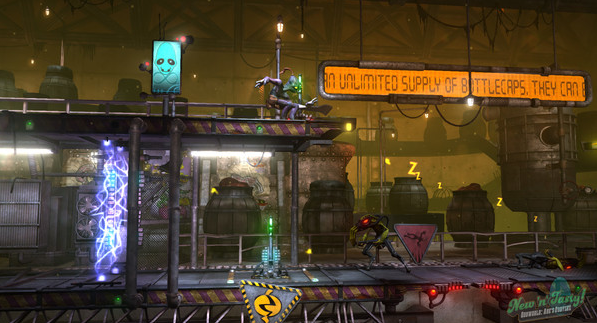 The new graphics do not look bad at all, they are quite smooth and helps make the Oddworld world look quite expansive as the 3D adds in more depth to the game. I wouldn't say that the new graphics are great though as it looks more like a middle ages PS3 title but don't let that turn you off, I did say that the graphics didn't look bad after all. 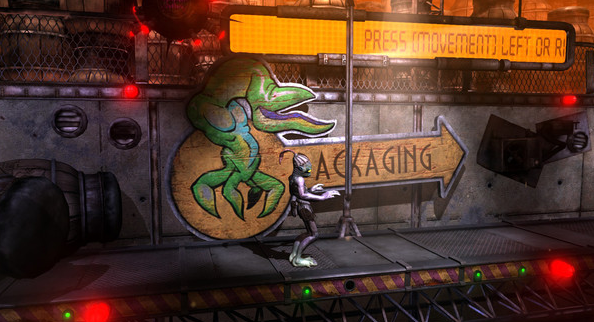 One downside about the graphics is that it does take away some of the Oddworld charm and mystique that was found in the original version of the game, do not worry though, you can still find the original version quite easy. You can buy working versions off the Playstation Network as a Playstation Classic title, and you can also get it on Good Old Games for if you want to play the original on PC. I really don't recommend getting the original PC title on Steam as it is oddly (no pun intended) not compatible with modern PC's. Animation in this game is good as it smooth and consistent but I wasn't a fan of Abe going into rag doll mode as soon as he dies and would much rather a proper death animation instead. Since this is done with the (*Holds in vomit again*) Unity Engine (*fails to hold in vomit*), expect there to be some weird bugs where characters will oddly clip through the floor and/or walls when they aren't supposed to. The bugs in this game were surprisingly very minimal as this is one of the more tighter games made with Unity, so the clip bugs aren't that common, this is rare for a Unity game as a lot of games made with Unity are buggy as all hell (from my experience at least). Soundtrack in this version is the exact same that is found in the original but does that mean that I enjoyed the soundtrack? Yes, yes I did. I found the soundtrack to be very fun to listen to as it has a nice indigenous sound that not only sounds good, it also gives the game a great atmosphere as the soundtrack has a very organic sound that feels very natural being a part of this game. Sound effects are something that I'm mixed on and I did enjoy all with exception of Abe's voice commands as the voice commands have been re-recorded with the goofy new Abe voice. The rest of the sound effects have a very charming, cheeky, and funny sound to where you'll find it very immature but also very enjoyable regardless of how mature you are as they are that well done. Overall, this is a very decent remake of the original version of this game although it's not as charming but is still good nonetheless. I recommend this game to both the original fans and to newcomers as well and you are bound to enjoy it, now we wait for the remake of Abe's Exodus. Fun game.